The three "Boland Schools" that faced their Western Province Premier peers from Cape Town on Saturday taught them a rugby lesson. Paarl Gimnasium downed Diocesan College (Bishops) by 31-10, while Paul Roos Gimnasium proved too strong for Rondebosch Boys' High by 31-7. Boland Landbou fired on all cylinders by defeating Wynberg Boys' High by 62-31 in an exciting match that delivered 93 points in 70 minutes. Durbanville made a huge turnaround by beating SACS by 33-24 in their clash. When these two teams met for the last time in Durbanville two years ago SACS walked from the pitch with the scoreboard 100-0 in their favour. Paarl Boys' High came out on top against a fiery Outeniqua by 34-26. Their Nr. 8, Gideon van Wyk, scored a brace of tries as Boishaai enjoyed most of the territory in the first half. Flyhalf, Kian Meadon, dictated play with his boot and kept his side in the strike zone. The home side led by 20-7 at the break. Stellenberg only managed to take the game away from Brackenfell in the second half of their encounter. Stellies enjoyed a marginal 14-3 lead at half-time but finished strong by claiming a 31-10 victory. Oakdale Landbou came out on top by 42-40 against HTS Drostdy in an exciting encounter just outside Riversdale. It seemed as if the status quo will be kept of the last couple of year's with the visiting side claiming victory, but the Bulle from Oakdale managed to grab the victory. The home side led for the first time when their outside centre, Alwich van der Linde, slotted a penalty in the 15th minute of the second half to give them a 35-33 lead. HTS Drostdy's flyhalf, Cariton Pietersen, enjoyed a good day at the office. He scored a hat-trick of tries and converted four of his team's tries for a personal contribution of 23 points. Tygerberg's centre Wiehan Meyer scored four tries as his team defeated Milnerton by 43-31. HTS Bellville's flyhalf, Ashwill Horn, scored all his side's points as the defeated Kasselsvlei by 19-13. Horn scored his side's only try which he converted and also slotted four penalties. Paarl Boys' High 34 (20) – Tries: Gideon van Wyk (2), Riis du Plessis, Xavier Farmer. Conversions: Kian Meadon (4). Penalties: Meadon (2). Outeniqua 26 (7) – Tries: Abré Minnie, Dillan Pieterse, Francois Breytenbach, Henry Tromp. Conversions: Matthew Thorne (3). 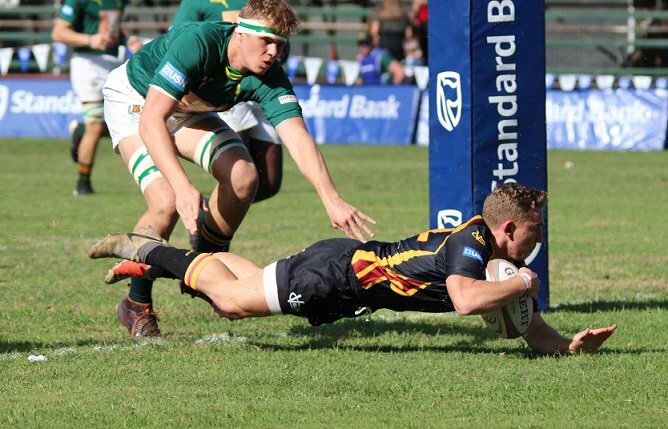 Paarl Gimnasium 31 (17) – Tries: Curwin Gertse, Ethan James, Reynhardt Crous, Pierich Siebert, Johan Smal. Conversions: Tiaan Swanepoel (3). Diocesan College 10 (0) – Try: Michael Ford. Conversion: Sacha Mngomezulu. Penalty: Mngomezulu. Paul Roos Gimnasium 31 (14) – Tries: Robbie Rodgers, Meiring Ebersohn, Cade Croy, Ronan Daniels, Andrew Pegg. Conversions: Kade Wolhuter (3). Rondebosch Boys' High 7 (7) – Try: Jordan Collier. Conversion: Conor van Eden. Boland Landbou 62 (26) – Tries: Canan Moodie (2), Tarique Pietersen, Keanan Wentzel, Eugene Snyders, CJ Snyman, Stefan Nortjé, Conrad Petersen, Jacques Mostert, Reinardt Spies. Conversions: Snyman (5), Wentzel. Wynberg Boys' High 31 (10) – Tries: Reece Brice (2), Lezaine Davis, Phil Mazango. Conversions: Devon Pretorius (4). Penalty: Pretorius. Oakdale Landbou 42 (20) - Tries: Tino Singe (2), Corné Rahl, Kaylim Cordier, Nico Pietersen. Conversions: Alwich van der Linde (2), Penalty Try. Penalties: Van der Linde (2). HTS Drostdy 40 (26) - Tries: Cariton Pietersen (3), Keane Galant, Roann Jansen, Stefan Schwarts. Conversions: Pietersen (4). Hugo Mostert. Durbanville 33 (7) – Tries: Ruan Steyn, Vincent van Dyk, Xander van der Westhuizen, Hanno van Biljon. Conversions: Van Biljon (2), Diagho Miggel (2). SACS 24 (12) – Tries: Kyle Kreymbord (2), Ian Patterson, Stuart Whittingdale. Conversions: Matthew Hayes (2). Stellenberg 31 (14) – Tries: Chappy van Schalkwyk (2), Tarquinn Manuel, Mika Cowley, Tyrone Rose. Conversions: Meyr Retief (3). Brackenfell 10 (3) – Try: Theo Jacobs. Conversion: Raven Smith. Penalty: Smith. Bellville 21 (14) – Tries: Thomas Booker, Muller Loubser, Ivano Jonkers. Conversions: Jaco Oosthuizen (3). Strand 15 (0). Parel Vallei 40 (14) – Tries: Michael Borchards (2), Ryan Coetzer, Markus Dempsey, Kyle Slater, Michael Henry. Conversions: Juan Cornelius (5). DF Malan 24 (10) – Tries: Enrico van den Heever, Jean-Louis Burger, Jason Breda. Conversions: Burger (3). Penalty: Burger. Tygerberg 43 (12) – Tries: Wiehan Meyer (4), Shaun Gordon, Byron Strydom, Logan de Bruyn. Conversions: Gordon (4). Milnerton 31 (12) – Tries: Heath Jacobs, Geno Kemp, Sieman Kele-Kwesawe, Sergio de Jesus, Brandon Boucher. Conversions: Mikyle Vraagom (3). HTS Bellville 19 (6) – Try: Ashwill Horn. Conversion: Horn. Penalties: Horn (4). Kasselsvlei 13 (8) – Tries: Enrico van Oordt, Declan Dames. Penalty: Justin Petersen. Tygerberg RFC 27 (17) – Tries: Rowan Pritchard, Quama City, Jan-Stephan Konstabel, Luciano Pietersen. Conversions: Angus Green (2). Penalty: Green. 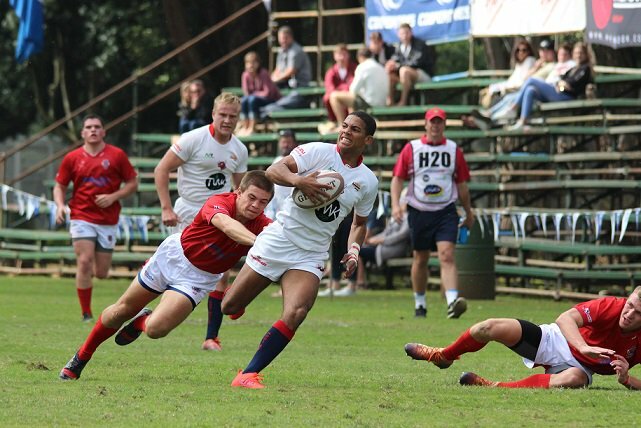 Hottentots-Holland 27 (8) – Tries: Tiaan Willems, Emile La-Meyer, Rodi Ramsay. Conversions: Junaid Phillips (3). Penalties: Phillips (2). Vishoek 17 (10) – Tries: Axemable Fanya, Rosco Knipe. Conversions: Blake Matthews (2). Penalty: Matthews. Jan van Riebeeck 14 (14) – Tries: Angelo Pieterse, Jacques van der Westhuizen. Conversions: Ruan Liebenberg (2). u19A: Primrose-klub 26, Monumentpark 12; Somerset College 60, Bergvliet 0. 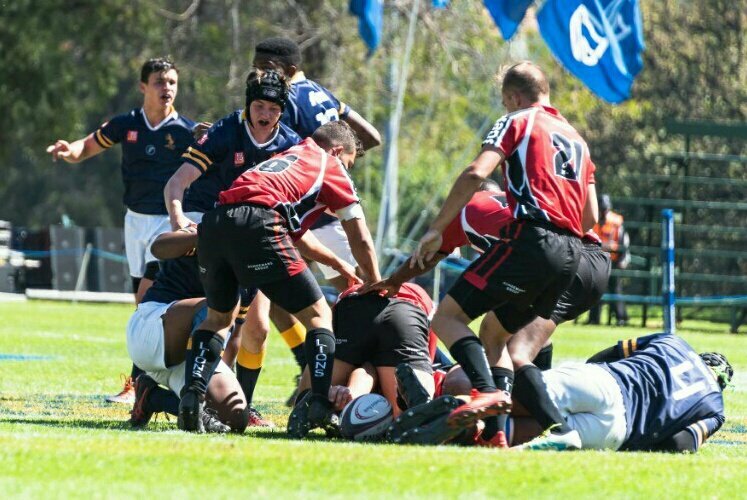 Excelsior 22, Parow 19; De Kuilen 35, Khayelitsha-vyftiental 7.
u19B: Paarl Boys' High 36, Outeniqua 21; Bishops 14, Paarl Gimnasium 40; Rondebosch 7, Paul Roos 38; Boland Landbou 40, Wynberg 24; Oakdale Landbou 22, HTS Drostdy 21; Durbanville 14, SACS 21; Stellenberg 47, Brackenfell 5; HS Bellville 36, Strand 12; D.F.Malan 15, Parel Vallei 33; HS Tygerberg 20, Milnerton 0; HTS Bellville 5, Kasselsvlei 0; Tygerberg-klub 12, HHH 5; Vishoek 17, Jan van Riebeeck 7.
u16A: Paarl Boys' High 42, Outeniqua 5; Bishops 22, Paarl Gimnasium 38; Rondebosch 19, Paul Roos 43; Landbouskool Boland 22, Wynberg 15; Oakdale Landbou 54, HTS Drostdy 0; Durbanville 0, SACS 22; Stellenberg 49, Brackenfell 14; HS Bellville 33, Strand 5; D.F.Malan 7, Parel Vallei 20; HS Tygerberg 10, Milnerton 23; HTS Bellville 20, Kasselsvlei 0; Tygerberg-klub 7, HHH 31; Vishoek 7, Jan van Riebeeck 28; Excelsior 19, Parow 21; De Kuilen 60, Khayelitsha-XV 10.
u15A: Paarl Boys' High 26, Outeniqua 3; Bishops 7, Paarl Gimnasium 52; Rondebosch 10, Paul Roos 7; Landbouskool Boland 29, Wynberg 12; Oakdale Landbou 31, HTS Drostdy 10; Durbanville 26, SACS 14; Stellenberg 34, Brackenfell 10; HS Bellville 56, Strand 0; D.F.Malan 21, Parel Vallei 24; HS Tygerberg 22, Milnerton 19; HTS Bellville 27, Kasselsvlei 7; Tygerberg-klub 31, HHH 26; Vishoek 60, Jan van Riebeeck 0; De Kuilen 17, Khayelitsha-XV 0.
u14A: Paarl Boys' High 30, Outeniqua 27; Bishops 7, Paarl Gimnasium 55; Rondebosch 7, Paul Roos 12; Landbouskool Boland 19, Wynberg 14; HTS Drostdy 19, Oakdale Landbou 5; Durbanville 41, SACS 17; Stellenberg 38, Brackenfell 0; HS Bellville 47, Strand 7; D.F.Malan 6, Parel Vallei 12; HS Tygerberg 5, Milnerton 39; HTS Bellville 58, Kasselsvlei 3; Tygerberg-klub 10, HHH 5; Vishoek 17, Jan van Riebeeck 24; Excelsior 14, Parow 12; De Kuilen 21, Khayelitsha-XV 12.